HomeA BOOKSHELF FULL OF BOOKS WITH THE POWER TO CREATE A READING CULTURE! KIR Foundation commemorated the World Book and Copyright Day on the 23rd of April 2018 by donating books and a Bookshelf to the Senior Secondary School Section of Community Secondary School (C.S.S) Abuloma . 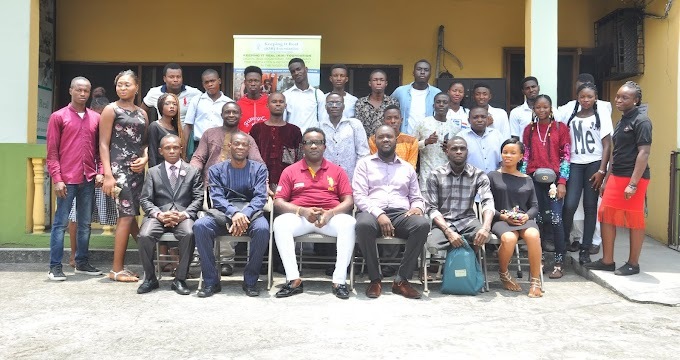 The Executive Director of KIR Foundation; Bitebo Gogo spoke to about 57 Senior Secondary School Students on the importance of reading books. She used the acronym; ‘CHANGE’, to emphasise her point. CHANGE; C=Creativity; think about solving problems, H= Do your homework, A= Be actively engaged in achieving your dreams, N= Never be lazy, G= Get up early and work hard, E= Educate yourself by reading off and online. She encouraged the students to become lifelong learners, so that they can achieve their dreams, become successful in life and make a positive difference in the society. “I say a very big thank you to KIR Foundation for the Bookshelf they donated to our school and for the insight that they shared with us on the WORLD BOOK and COPYRIGHT DAY 2018. I could relate to the acronym that was used on that day; ‘CHANGE’, which has really helped me; now, I allocate time for reading”. “The donation of the bookshelf and books have helped me and my fellow students to learn more and improve in our academics. Also, Dr. Bede Nwosu, Principal of C.S.S Abuloma, thanked KIR Foundation and said; “When I made the first contact with the organization, I made a plea that the school needed a bookshelf because, before now, an organization came to donate books, but where to keep the books was a challenge. The only place to keep the books was on the floor in my office and when it rained, some of the books got damaged. I was surprised when a staff of KIR Foundation called me and informed me that the organization was coming to the school to donate a bookshelf. The donation of the bookshelf has really helped us to display our books and we have been encouraging students to borrow books after school to take home and when they come back the following day, they are required to explain to the teachers what they learnt from the books they read. This development has enabled us to encourage the habit of reading amongst our students. Thank you very much”.